Three University of Washington professors have received the 2016 Presidential Early Career Award for Scientists and Engineers, the highest honor given by the U.S. government to early career scientists and engineers. David Masiello, an assistant professor of chemistry and adjunct assistant professor of applied mathematics; Shwetak Patel, the Washington Research Foundation Entrepreneurship Endowed Professor in Computer Science and Engineering and Electrical Engineering; and Luke Zettlemoyer, associate professor of computer science and engineering, were among the 105 recipients announced by the White House Thursday. Awardees are selected for their “pursuit of innovative research at the frontiers of science and technology and their commitment to community service as demonstrated through scientific leadership, public education or community outreach,” according to a White House release. The awards will be presented at a White House ceremony, and each recipient will receive up to five years of federal research funding. Masiello was nominated by the National Science Foundation for “his cutting-edge research in the emerging field of theoretical molecular nanophotonics, and for his comprehensive educational and outreach programs including an exemplary focus on enhancing the scientific communication abilities of young researchers.” Masiello’s research group builds theoretical and computational tools to understand the optical, magnetic, electronic, and thermal properties of nanoscale materials. 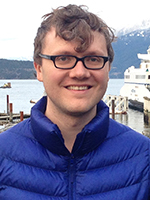 Additionally, James Thorson, operations research analyst with the Northwest Fisheries Science Center in Seattle and an affiliate professor in the UW’s School of Aquatic and Fishery Sciences, is also a recipient of the early career award. Thorson, who teaches an upper-level fisheries course, conducts research on spatial variation in fish population density and productivity, and spatio-temporal dynamics for marine ecosystems including the potential impacts of climate change. He received his doctorate from the UW, where he worked with professor and school director Andre Punt. Thorson was nominated for the award by the U.S. Department of Commerce. Twelve federal departments or agencies nominate young scientists and engineers from across the country whose “early accomplishments show the greatest promise for assuring America’s preeminence in science and engineering and contributing to the awarding agencies’ missions.” The final awards, first established by President Bill Clinton in 1996, are coordinated by the Office of Science and Technology Policy within the Executive Office of the President.